I am always on the lookout for easy and healthy breakfast options. It can sometimes be difficult to find a breakfast that can be eaten on the run that isn’t packed full of sugar. The typical granola bar usually has about the same amount of sugar as a chocolate bar…no thanks. Not first thing in the morning at least! 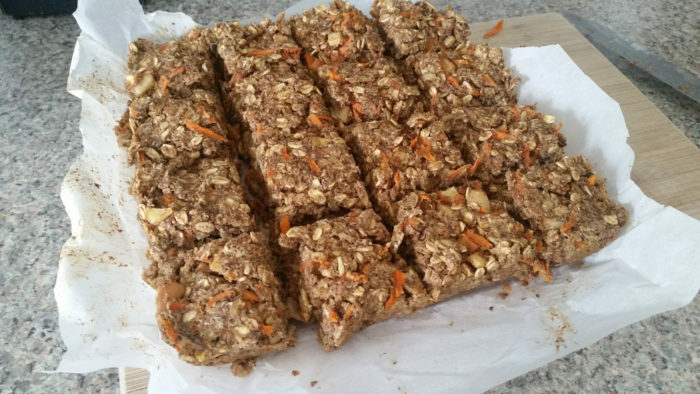 These breakfast bars are the perfect solution. They can easily be tossed into a Tupperware if you’re in a rush to get out the door. Also, they taste like carrot cake, so that’s a win in my book! Let cool, then remove from pan by lifting the parchment paper. These will last in the fridge for 3-4 days. I suggest freezing some for later.